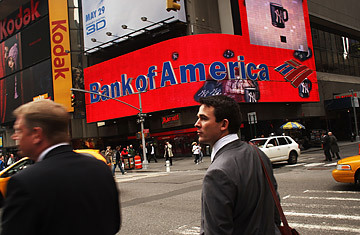 A Bank of America billboard in Times Square, NYC. Mere months after the financial system almost collapsed, banks are making money again. One after the other, they've reported big profits for the first quarter: $4.2 billion at Bank of America, $3 billion at Wells Fargo, $2.4 billion at JPMorgan Chase, $1.8 billion at Goldman Sachs, even $1.6 billion at Citigroup  which lost $18.7 billion in 2008.